Valentine’s day is nearly upon us. While we think we know the perfect gift—something from St. Croix Collections—this season of love gives us the right opportunity to shine a spotlight on some great things we love about St. Croix products and things we love that are valentine-y. Did you know that the inside of our garments are basically as great-looking as the outside? Our passion for perfection means that we make every part of our knitwear the best it can be—and that means the inside as well! We take great care to make sure everything feels as good (or better!) as it looks, so there are no crooked seams or loose threads inside our clothing to make the wearer uncomfortable. Have a St. Croix handcrafted sweater? Turn it inside out…you’ll see what we mean. The little sticker that says “Inspected by Lacey” is almost the only indicator that you’re looking at the inside of the sweater. We love it like this and wouldn’t have it any other way. Recently shave and spa products for men have become more popular, making greater varieties more readily available. One of the brands we’ve discovered we love is Jeeves of Hudson Street. There are many reasons it’s sensational. 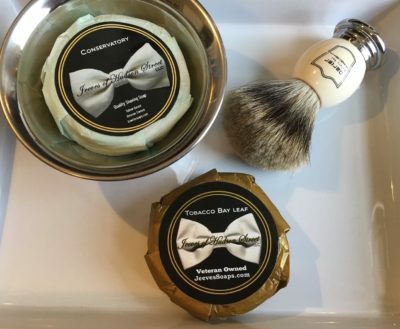 The bars and jars of traditional shaving soap have an old-school feel to them. Second, the scents are amazing. One of our faves is Tobacco Bay Leaf. It harkens to the past, but is clean and fresh. And finally, the company is veteran-owned and operated. They have simple values, such as making excellent small–batch products and attaining modest growth, while making a positive impact on their employees and community. Love that! You’ve heard us mention this feature before, but our never-roll collars are definitely on our love list. Our exclusive technology with the flexible stays inside every knit collar finishes off the garment so perfectly. 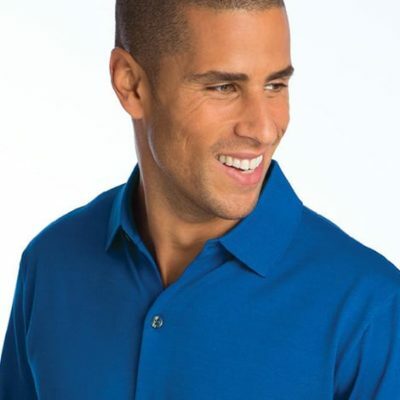 Our philosophy is this: why spend so much money and time to make a great garment only to have a collar that rolls up or under and never looks as good as it did when you bought it? Our collars, like the rest of our clothing, have been perfected for maximum performance not just the first time you wear them, but every time. These collars always lay flat, always look great. One of the benefits of in-person travel for trend research is that you get to experience flavors from around the world. Every year our design team travels the same route through Europe, and we’ve stumbled onto some favorite places that we visit every time. 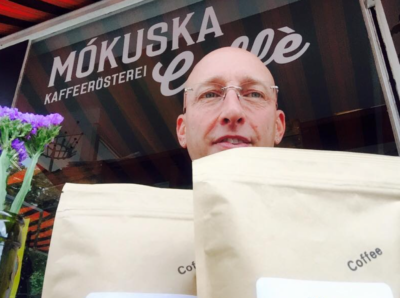 One of those places is Mokuska Caffe, a fantastic coffee shop in Stuttgart, Germany. The coffee is superb every time. As we’ve gotten to know the owner, we’ve learned that he’s as obsessed with perfection in his craft as we are in ours. There are so many things to love about the St. Croix products. But sometimes it’s the little things that make the biggest difference. Our socks, for example—have you tried them? If so, you already know why they are special. Yes, they are colorful and the designs are fantastic. But the thing we love the most are the seamless toes. No lumps, no strings…nothing to get in the way of pure comfort and luxury. Our all day walking tours of Europe require good shoes and good socks, and we wouldn’t wear anything else! It wouldn’t be a Valentine’s story without a mention of chocolate. 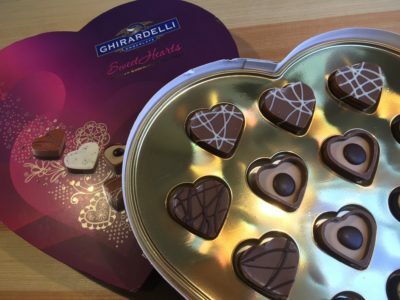 One of our favorites is Ghirardelli Chocolate. The Sweet Hearts Assortment offers a great blend of treats that look as amazing as they taste. The Ghirardelli company is based in San Francisco (where there are several stores that carry a great selection of St. Croix! ), and always offers fabulous chocolates that you can rely on for a special gift. You can never go wrong with chocolate, trust us. Those are just some of the things we’re loving right now. We’d love to know what’s on your list!